Trivia time: How many musicians have had a song on the Billboard Top 40 in each of the past four decades? Think about it. Ready? Go. Did you say Prince? Nope. Billy Joel? No. What about Bruce Springsteen? Sorry, you’re getting colder. You probably have named one by now: Michael Jackson. Yeah, he cranked out a few hits and records. Got another? Did you say Madonna? Correct. That’s two. The Material Girl has done pretty well for herself. Got a third? It’s tough, isn’t it? OK, here are some clues to help you name the third — and final — person on the list. • He’s been nominated for 15 Grammys and has won four, so it’s not a woman or Elton John. • He’s from California, so forget about Garth Brooks. • He’s playing the Hippodrome for the first time on Wednesday after having played more than 1,500 concerts worldwide. • His first name is Alfred. • He can rock an accordion like no one’s business. If you said Alfred “Weird Al” Yankovic — the goofball who has soared into music history by performing spoofs and parodies — you’re right. And don’t worry if you are laughing about Mr. “White & Nerdy” being included on this list because Yankovic also chuckled when asked about his place alongside the King and Queen of Pop. 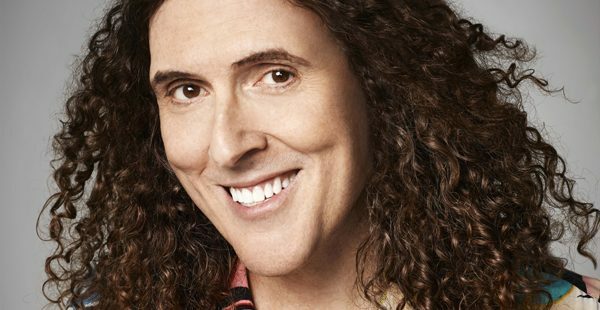 “Weird Al” Yankovic brings “The Mandatory World Tour” to the Hippodrome on Wednesday. But there’s nothing Yankovic, who has made his career using witty words and humor, needs to say. He already said plenty through his work, putting out 14 albums to become the best-selling comedy recording artist in history with over 12 million albums sold. And he’s showing no signs of slowing down. Yankovic’s “Mandatory World Tour,” which supported his Grammy-winning “Mandatory Fun” album, is on its second round after visiting more than 100 cities in the U.S., Canada, Europe and Australia in 2015. This year, the tour will hit 79 cities. “Mandatory Fun” debuted on the Billboard Top 200 album chart in July 2014, becoming the first comedy album to do so. It’s also the first comedy album to reach the top spot since Allan Sherman’s “My Son, the Nut” in 1963. 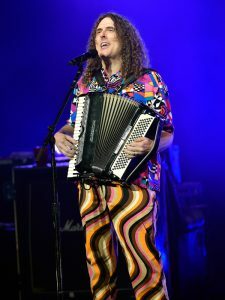 The album contains parodies from some of pop music’s biggest hits, including Pharrell Williams’ “Happy” (“Tacky”), Lorde’s “Royals” (“Foil”), Iggy Azalea’s “Fancy” (“Handy”) and Imagine Dragons’ “Radioactive” (“Inactive”), as well as Yankovic’s “NOW That’s What I Call Polka,” in which he plays an accordion to a medley of songs. The album took off. It produced Yankovic’s best week of sales in his career and the largest sales week for a comedy album since 1994. Yankovic was a huge hit on Spotify, where he set a U.S. record for having the most songs, with four, from one album in the viral top 10 at one time. “I’m having my most success now and I thought I peaked 30 years ago,” Yankovic, 56, said. Yankovic’s approach to music hasn’t changed very much since he first sent homemade tapes to the Dr. Demento Radio Show as a teenager in Lynwood, Calif.
His rule is simple: No singer or band is off limits. Yankovic has made millions by making fun of other’s work. He turned Jackson’s “Beat It” into “Eat It,” Madonna’s “Like A Virgin” into “Like A Surgeon” Coolio’s “Gangsta’s Paradise” into “Amish Paradise,” Chamillionaire’s “Riding Dirty” into “White & Nerdy,” Miley Cyrus’ “Party in the U.S.A.” into “Party in the CIA,” Nirvana’s “Smells Like Teen Spirit” into “Smells Like Nirvana,” and well, you get the point. But Yankovic’s funny lyrics wouldn’t have gotten him to where he is today if he didn’t know how to deliver them to the masses. In the 1980s, his videos were staples on MTV. Now, he’s shifted to the Internet. His YouTube channel is filled with video and tour propaganda, while his Twitter account (@alyankovic) has more than 4.09 million followers, his Facebook page has 1.778 million likes and more than 196,000 follow him on Instagram at alfredyankovic. During an eight-day span, Yankovic’s released eight music videos on the Internet (“Tacky,” “Word Crimes,” “Foil,” “Handy,” “Sports Song,” “Lame Claim To Fame,” “First World Problems” and “Mission Statement”) and generated more than 46 million views combined. And that was just in the first week.